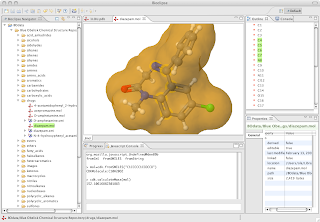 Today, Bioclipse 2.0 Release Candidate 4 (versioned 2.0.0.RC4) was released. The release requires a fresh download from Sourceforge, and we kindly ask beta-testers for bug reports on the bugs.bioclipse.net. Hopefully this will be the candidate for the 2.0 release. 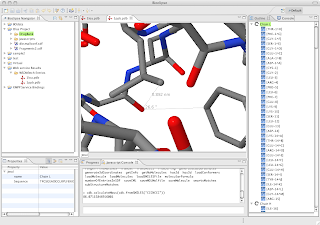 Today, Bioclipse 2.0 Release Candidate 3 (versioned 2.0.0.RC3) was released. The release requires a fresh download from Sourceforge, and we kindly ask beta-testers for bug reports on the bugs.bioclipse.net. 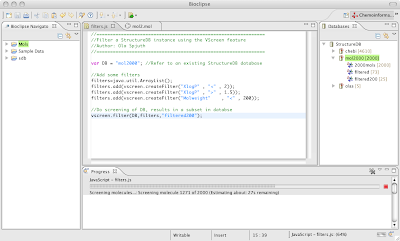 Today, Bioclipse 2.0 Release Candidate 2 (versioned 2.0.0.RC2) was released. The release requires a fresh download from Sourceforge, and we kindly ask beta-testers for bug reports on the bugs.bioclipse.net. 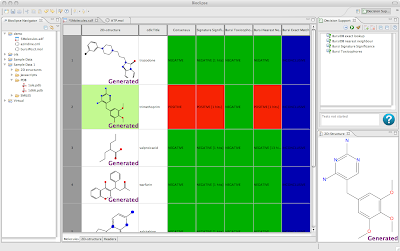 Today, Bioclipse 2.0 Release Candidate 1 (versioned 2.0.0.RC1) was released. This constitutes a big step towards the Bioclipse 2.0 release and also implies a feature freeze. 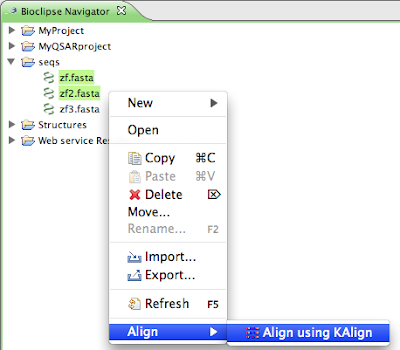 The release is available from Sourceforge, and we kindly ask beta-testers for bug reports on the bugs.bioclipse.net. a SMARTS hit highlighted as substructure. 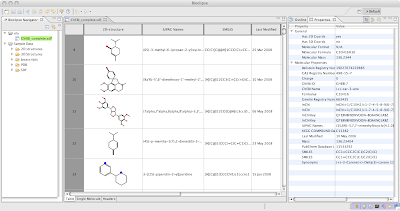 Bioclipse 2.0RC1 includes the core, chemoinformatics, and balloon features as well as extended sample data, the Blue Obelisk Data Repository, and the Drugbank collection. 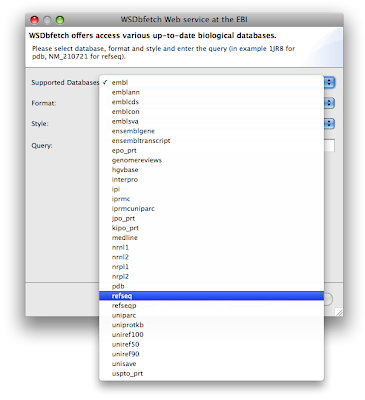 On the main update site are the Bioclipse SDK, CDK Power tools, XWS4J, and hivpred features. 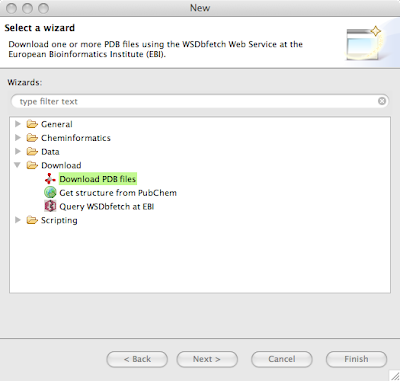 The Experimental update site contains the experimental feature (with R support), the QSAR, RDF, and XML feature. See www.bioclipse.net and the Bioclipse Wiki for more information about the features. 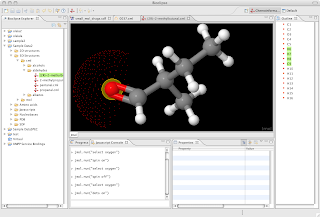 Today, Bioclipse2.0 beta4 was released (versioned 2.0.0.B20090409). Grab your download from Sourceforge (unfortunately this release cannot be updated from the update site). 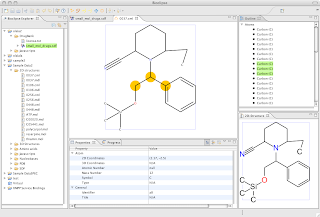 This is (hopefully) the last beta release before Release Candidate 1, and contains numerous bug fixes, Balloon for 3D conformer generation, and a SmartsView for testing out SMARTS on your chemical structure. Please report any bugs to http://bugs.bioclipse.net. 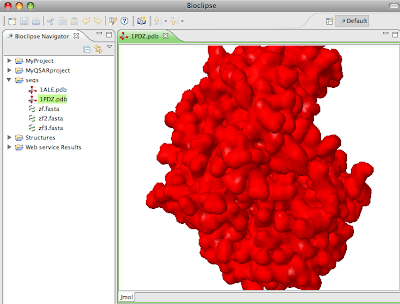 Screenshot: Bioclipse 2.0beta4 with all Features installed from update site. 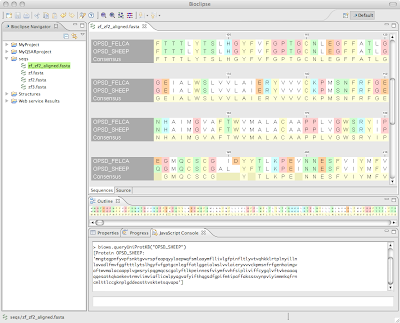 From left to right: Eclipse RCP, XWS4J, CDK Extras, Sample Data, Blue Obelisk Data Collection, Balloon, QSAR, HIVPred, and Chemoinformatics. To learn more about the features and projects in Bioclipse, see the Bioclipse Wiki. 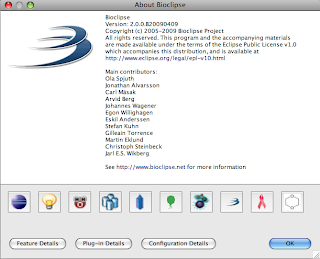 Today, Bioclipse2.0 beta3 was released with id 2.0.0.B20090227. Grab your download from Sourceforge. 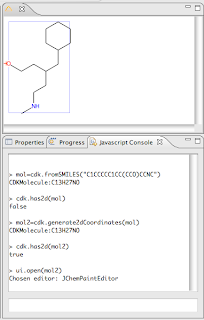 The major updates in this release are many bug fixes for JChemPaint for 2D editing, and a new MoleculesTable with resizable columns and rows (see Figure 1) for working with collections of molecules. 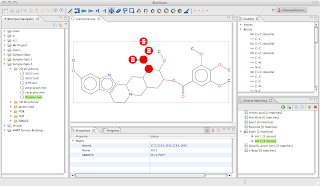 Figure 1: Screenshot showing the new MoleculesTable with resizable columns and rows (middle), the selected molecule in the 2DView (top right) and molecular properties of the selected molecule (bottom right). Also added is a new update site for experimental features, including an early version of the Bioclipse QSAR package (see Figure 2). Experimental site will be used extensively in the future to give users the ability to test new features that are in development. 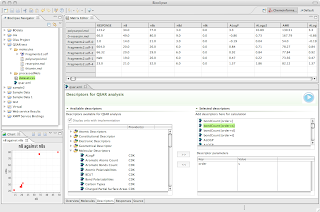 Figure 2: Screenshot showing the experimental QSAR editor (bottom), the Matrix editor (top) and a Plot (bottom left) of two descriptors against each other. Please note that you need to download a fresh version from Sourceforge, it is not possible to upgrade from Software Updates inside Bioclipse. 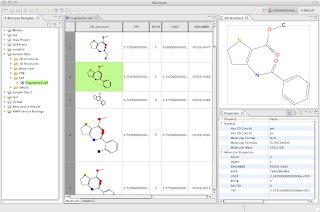 Today, Bioclipse2.0 beta2 was released. The status was unfortunately not good enough so that a release candidate could be made available this week. Anyway, the beta2 version is packed with new features, like a completely new Welcome page, SMILES files support, and numerous updates to JChemPaint for 2D editing. Existing users cannot upgrade to Bioclipse 2.0beta2 via online updates; the version requires a fresh download from Sourceforge. 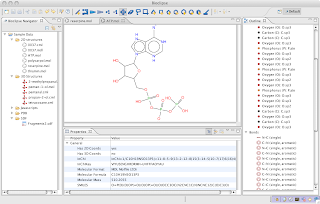 Figure: A drug visualized in 3D using the isoSurface command in Jmol. Existing users cannot upgrade to Bioclipse 2.0beta via online updates; the version requires a fresh download from Sourceforge and read the installation guide. More information: See the Bioclipse website and the Bioclipse development wiki.